Sharing my experience going through Chemotherapy and recovering from a brain tumor. Now that I’ve written a little about my time in the hospital I thought I’d write about the surgery itself. To give more information about the surgery, I have to talk more about the tumor itself. As I said in my last post, I began meeting with doctors because I was having double vision. Once I had the MRI that reviled the tumor doctors discovered that the double vision was occurring because the tumor was putting pressure on my retinal nerves. The tumor was particularly located on the chiasma. This meant that when the surgeons went in to operate they wouldn’t be able to cut the entire tumor out… this was because if they touched the retinal nerves, I’d totally lose my vision. In the end, the surgeons preformed a simple biopsy. My preparations for surgery began late the night before I went into surgery. Starting at midnight the night before I went down to the OR, I was not allowed to eat or drink anything. I didn’t go down to the pre-op until 5PM the next day. I was sooo hungry! When I was finally wheeled down to the pre-op I met with some of the nurses that would be in the OR as well as the anesthesiologists. When meeting with the anesthesiologists I told them that my one goal was not to remember anything from the OR. The anesthesiologists gave me medicine in the pre-op to begin the process of knocking me out. That stuff made me loopy! Finally, I said goodbye to my parents and was wheeled into the OR. Once inside I was surrounded by nurses and doctors who were ready to knock me out for real! They put a mask over my mouth and nose and asked me to count down from 100. Counting down from 100 turned out to be very eventful because I made it all the way to 86. Apparently most people don’t make it past 95. That’s the last thing I remember from the OR! Next thing I knew, I woke up again in my room in the ICU. My mom was beside me and informed me that the surgery only lasted three hours, which apparently is a very good sign for neurosurgery. The doctors reported that the tumor was squishy and it waas easy to remove a small piece for testing. When I woke up I immediately noticed three things. The first was that my hair was parted and felt as though it was gelled. That’s because the doctors didn’t have to cut my hair at all, instead they just parted it with a Vaseline like gel. The second thing was that I had a tube coming out of my head. This was because the doctors needed to put in a drain for the fluid that was building up in the fluid pool’s of my brain. Finally, I felt very nauseous from the anestesia. I was throwing up which was a little painful, because there was nothing in my stomach to throw up! Over the next few days I began recovering from the surgery. I was constantly meeting with different doctors. I was given morphine every four hours to help deal with the pain… It obviously worked because I don’t remember being in much pain!! One of the first things I remember after surgery is my surgeon, Dr. Storm, walking in and called “Mr. 86!” which I quickly learned was quite the accomplishment! Eventually I had to get another MRI late at night. Also, the tube was removed from my head (which turned out to be a very painful process). 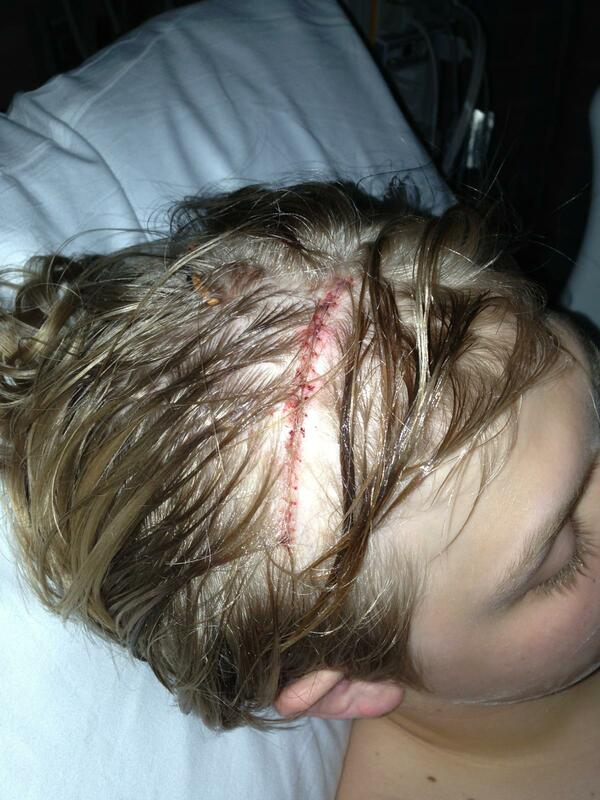 The stitches and incision site from my neurosurgery. if it’s a little too graphic for some of you. Wow, Josh, I had no idea you had that large of an incision. How kind it was for the doctors to gel it back instead of shaving your head. My husband is an anesthesiologist and I told him your “Mr. 86” story and he laughed. Indeed, few people are able to count back that far before they are fast asleep. You are doing a great job with this blog, keep writing and sharing. I hope one day you’ll be able to look back,reflect on this writing and know how brave you were to share. You are an extraordinary young man and I join hundreds of others in wishing you well. No More Needles to the Chest; Last Infusion! A marathon of doctors visits at CNMC! kikijanel on A Lot To Be Grateful For!